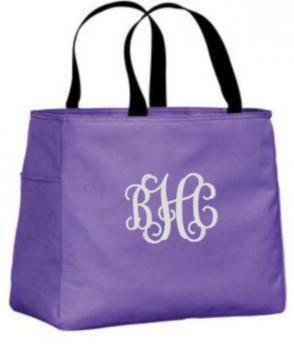 Monogrammed Tote bags large enough for the beach, carry all your essentials in this roomy tote. Order came sooner than expected. Style and design as described. Great quality,sturdy material, vibrant color. Handles could be a bit longer but otherwise, truly satisfied with product Excellent customer service-Judy personally followed up with me.I've ordered more since then. Thank you! !